Psychiatry Review and Canadian Certification Exam Preparation Guide is the first exam preparation text intended specifically for candidates taking the Royal College of Physicians and Surgeons of Canada (RCPSC) psychiatry examination. This concise, single volume review contains "Canadian-specific" content so that readers need not modify other sources, but may rely on it as their primary source of preparation. The volume is based on The American Psychiatric Publishing Board Review Guide for Psychiatry and cites only validated sources used in other APP books, so candidates can be assured of its content integrity. It has been fully updated, and it includes a multitude of features that will appeal to harried candidates: The information presented is consistent with Canadian psychiatry practice. References have been drawn from the Canadian psychiatric literature, and laboratory units; medication names and doses, and the language employed are consistent with Canadian medicine and psychiatry; The volume is organized according to familiar DSM-IV classifications, allowing readers to quickly locate the most appropriate chapter. It does not neglect foundational knowledge, however, offering complete coverage of basic neuroanatomy as well as more advanced topics such as neuroimaging, psychopharmacology, and the cultural and legal aspects of psychiatric illness; Quick-reference tables summarizing diagnostic criteria for specific psychiatric disorders and other critical information are especially useful and abundant; and A rigorous 200-question practice exam and answer guide provide a reality check for prospective exam takers. The exam's structure reflects the actual board examination, with question topics commingled, and candidates seeking additional questions and annotated answers to enhance their preparation are referred to additional online self-assessments. 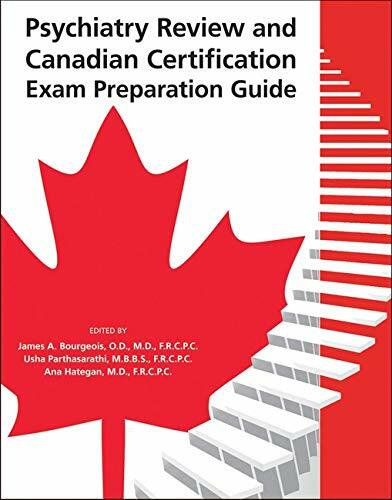 The Psychiatry Review and Canadian Certification Exam Preparation Guide represents the best of psychiatric scholarship, combined with insight into the RCPSC psychiatry exam, and a keen eye for presenting the necessary information in a logical, easy-to-remember manner. This one-stop resource is destined to become candidates' constant companion in the months leading up to the exam, and after. "Very thorough and comprehensive yet concise. Useful tool for quick review, with a vast amount of information." -- "Roumen Milev, M.D., Ph.D., F.R.C.Psych., F.R.C.P.C., Professor of Psychiatry and Psychology and Head, Department of Psychiatry, Queen's University, Kingston, Ontario"
"A well-organized and comprehensive review with contributions from well-known experts in the field. The Canadian perspective is a welcome addition, especially for legal aspects of psychiatric practice. The summary of key points at the end of each chapter, reference lists, and practice examination will be particularly appreciated. This book promises to become a valuable resource for residents during training and exam preparation." -- "Mimi Israel, M.D., F.R.C.P.C., Chair, Department of Psychiatry, McGill University, and Psychiatrist-in-Chief, Douglas Mental Health University Institute, Montreal, Quebec"
James A. Bourgeois, O.D., M.D., F.R.C.P.C., is Professor and Vice-Chair of Education in the Department of Psychiatry and Behavioural Neurosciences at McMaster University in Hamilton, Ontario, Canada. Usha Parthasarathi, M.B.B.S., F.R.C.P.C., is Assistant Clinical Professor in the Department of Psychiatry and Behavioural Neurosciences at McMaster University in Hamilton, Ontario, Canada. Ana Hategan, M.D., F.R.C.P.C., is Assistant Clinical Professor in the Department of Psychiatry and Behavioural Neurosciences at McMaster University in Hamilton, Ontario, Canada.